I was recently contacted by Mr. Stephen Archer of Archer Airguns who had the idea to create custom parts for the Benjamin Marauder Air Rifle manufactured by Crosman. Stephen saw the opportunity to modify stock parts to streamline the firing of the various pellet sizes available for the Benjamin Marauder platform. The Benjamin Marauder is available in .177, .22, and .25 caliber pellet sizes. The latest single shot tray design from Archer Airguns allows for a more efficient and effective loading process of the various pellet sizes, while preventing pellets from falling back into the hammer assembly. Here is a link to the .25 Cal single shot tray currently available on the Archer Airguns Website. 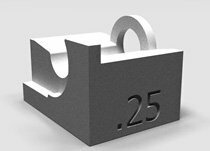 The 3D printed single shot tray is available for .25, .22, and .177 cal. pellets. Mr. Archer had a clear vision of what the design required. Working with Finnovation Product Development, Stephen was able to refine the design utilizing Autodesk Inventor, into a 3d Printable design to be produced on the 3D Systems sPro SLS production grade 3D printer. The parts are produced using a durable Nylon 12 material in a matte black finish. Stephen is able to replenish his stock in as little as 24 hours without tooling costs or extended lead times. "This particular application is a perfect example of how 3D printing can streamline your design and manufacturing process, while reducing overhead production costs. Parts like these can be printed by the 100's and shipped within 24 hours from order." Stay tuned to Archer Airguns for more aftermarket designs available for many popular airgun platforms that are sure to help keep your groupings accurate and precise. Contact Finnovation Product Development to inquire about how the latest in Additive Manufacturing technology can get your product designs to market faster, more cost effectively, and 100% made in the U.S.A.